The newest cars on the market have the most up to date safety features such as breaking assist, reversing cameras or sensors, stability control and seat belt sensors. Even the most entry level models come with many of these technologies that protect you from a serious crash. Some car brands offer favourable financing to assist buyers into a new car, occasionally offering finance as low as 1% over a 3-year term. With used vehicles, the financing rate is typically around 12.5% depending on your credit rating and ability to service the loan. All new vehicles come with a factory warranty – which is typically 3 years or 100,000km. If you buy a used vehicle from a licensed dealer you are guaranteed some protection under the Consumer Guarantees Act, Fair Trading Act and Sales of Goods Act, however it could mean a long drawn out process through the Motor Vehicle Disputes Tribunal if the dealer won’t remedy your issue in the first instance. There is no guarantee of the outcome of this process. If you buy your vehicle privately you have very little recourse. 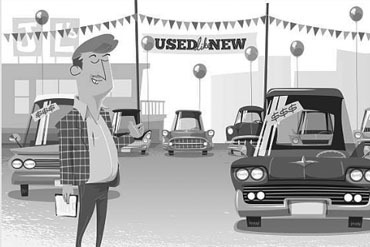 A new vehicle will have a higher resale value than a used car. The purchase price of the vehicle was $18,500 – not insignificant sum for a used vehicle. When we factor in everything about the vehicle car such as financing, running costs and ultimately its resale value it would have been better value ) to look at brand new options. Here is a simplified example that looks only at the transaction price of the vehicle compared to a new Nissan Pulsar ST.
Nissan have some of the best finance deals on the market - in this example we have used the finance special from the "Big One" deal that they ran through to the end of March 2016. The deal was a 1% finance deal on the entire range over 36 months. For long periods the finance rate increases slightly and for 60 months (5 years) the finance rate is 3%. Excluding establishment fees and other admin fees if we were to look at the interest rate alone the weekly repayments are only $27 more for a brand-new vehicle. If you factor in safety, warranty and other running cost the Nissan Pulsar is in our opinion a better value purchase than the used Mazda 6 car.